Choosing the right kind of peg is crucial to the stability of your tent. Basically, there are four different kinds of pegs: universal pegs, pegs for forest and meadow soils, pegs for rock and very hard bases and pegs for sand and snow. Universal pegs are included with most simple tents. Using these you will soon find that your tent is not equally stable on every camp site. The differences arise from the different types of soil. 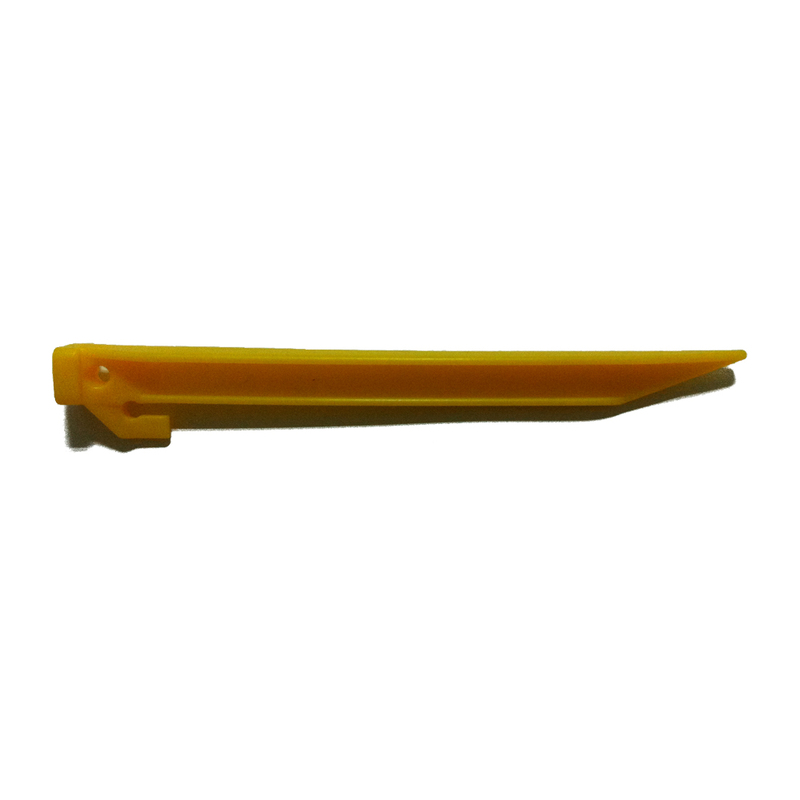 For use on forest and meadow soils, Outdoorer recommends the plastic Eagle Claw pegs, which are made of high quality PP. You can purchase the Eagle Claw tent pegs at Amazon. Generally with tent pegs the rule of thumb is that the denser the soil is, the thinner the peg should be. The looser the ground, the more space the peg needs for a reliable grip. The plastic Eagle Claw tent pegs are ideal for thoroughly mixed soils, such as those found in forests and meadows. You can also use it to anchor your tent safely on hard soils, because the T-shape makes the pegs very stable. 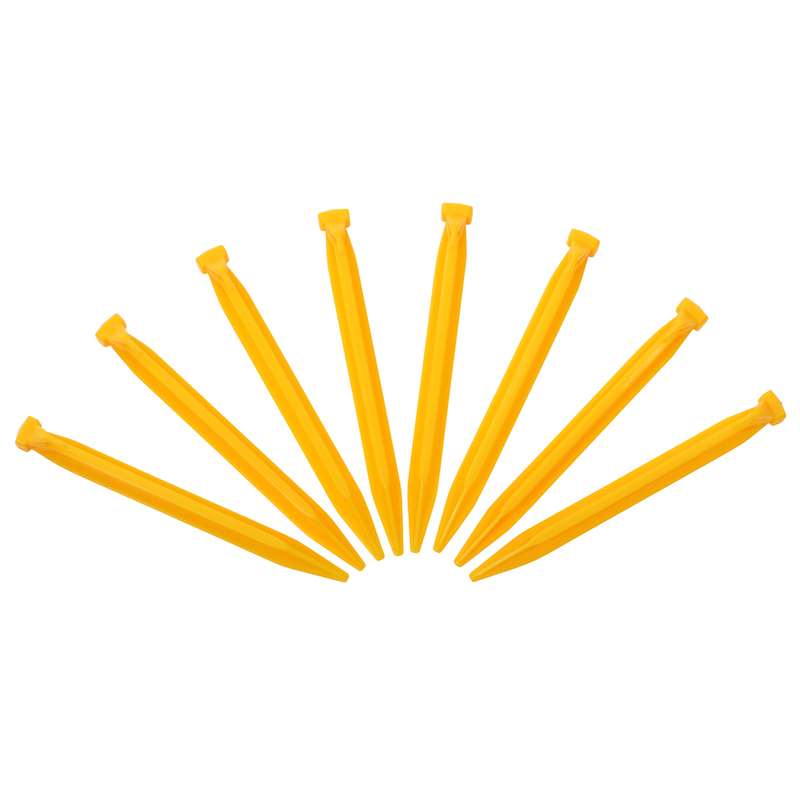 Polypropylene was used for the Eagle Claw tent pegs. This is light and strong and does not bend. Thanks to the signal colour of yellow they are easy to spot in the ground and this reduces the risk of stumbling over the peg in the night. The T-profile makes the peg extremely stable and it can be even used in hard soils without it bending. If you do not know exactly the soil conditions are at your camp site, you should resort to pegs with T-Profile. These can be used even on difficult soils. A tent peg must not be sunk into the ground in one fell swoop. The best way is to gently pat it is because you do not know if there are any stones below the ground. If too much force to use the peg could bend or in worst case even break. Don’t forget – take a rubber mallet and a peg lifter with you when camping so you can be sure to put the peg in safely and also be able to remove it. Where can you buy the Eagle Claw tent pegs? You can order the tent pegs Eagle Claw via Amazon.